We arrived at Trois Rivieres late yesterday afternoon, and because of the tides didn't leave until noon today, finally arriving in Quebec City around 7pm. The marina here is really cool, with an enclosed basin that you enter to get our of the river current, followed by a lock into the marina basin. Quebec has a 14-16' tide, and to shield the marina from that, there is a lock. At high water they leave it open to flood and flush the marina basin, then over the course of the low tide cycle people can enter and leave via the lock. Here's an updated map showing incremental progress (green) since Montebello. We've covered another 250 miles for a total of almost 1200 miles so far. At this point daily mileage will be much higher overall - probably in the 60-100 miles per day range. This is partly because we no longer have any locks to slow us down, but also because there just aren't any stops closer together. That said, I think we are going to stay in Quebec for about a week. Right now to catch the tides to our next location would mean leaving mid/late afternoon and arriving at 8-9pm, or leaving around 2am and arriving at 8-9am. Neither of these is appealing, so we are going to wait for the tide cycle to come around to a more favorable time of the day. 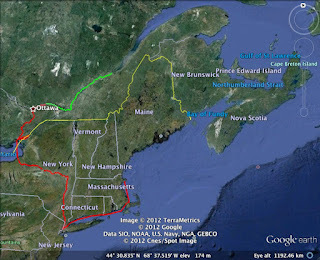 It will also give us a a chance to do some broader exploration of the greater Quebec City area. Glad you posted the map, it puts your trip/travels into perspective. Loving the blog! Glad you are enjoying it. Quebec is a really cool place, but there's one thing I find kind of annoying. Throughout Canada all publicly funded signs, plaques, brochures, etc are in French and English. It's a nice, inclusive gesture to French-speaking Quebec (the whole province, not just the city). At least it's true everywhere except Quebec. It's not a problem since my French is coming back to me pretty well, but it does seem a little hypocritical to not return the favor.